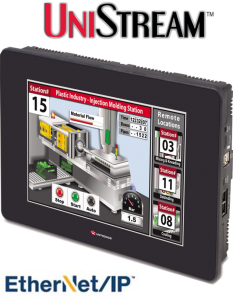 UniStream, the award-winning PLC + HMI all-in-one controller now supports the ODVA’s EtherNet/IP™ Industrial Ethernet standard. Unitronics announced that UniStream successfully passed the ODVA conformance test, and has been certified as compliant with the standard and interoperable with other EtherNet/IP devices. UniStream can function simultaneously as both EtherNet/IP I/O Scanner and Adapter, exchanging I/O data via its two Ethernet ports with other EtherNet/IP compliant devices. In addition, a single controller can contain multiple scanner and adapter definitions. 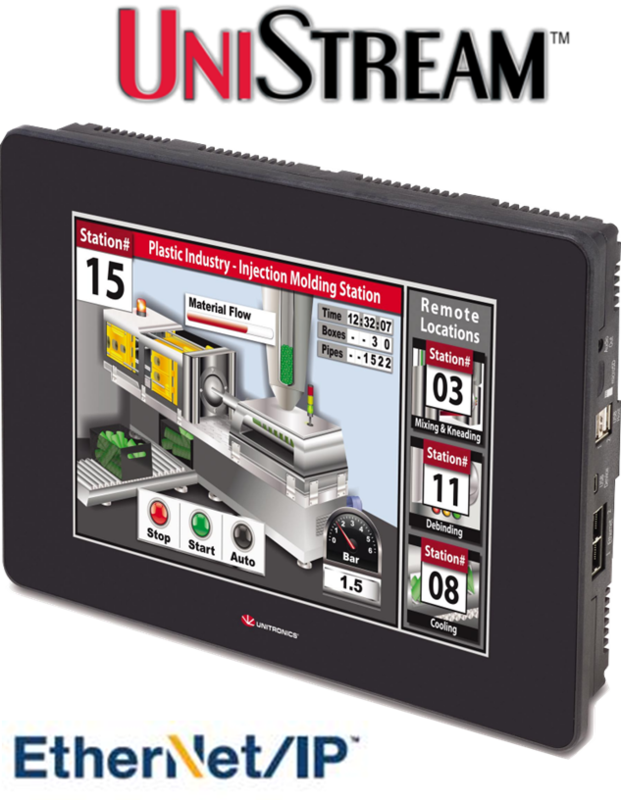 Combining UniStream and the EtherNet/IP protocol facilitates high-performance efficient I/O data exchange in real time, resulting in much faster process control and benefitting other industrial automation applications. Via EtherNet/IP, a UniStream controller can directly read the inputs and control the outputs of I/O blocks and compatible EtherNet/IP devices produced by other vendors. Thus it is now easier to integrate the UniStream in plant wide networks and motion control applications. No special software add-on or gateway is needed—just UniLogic, the all-in-one programming environment for UniStream, which is provided free of charge. A simple, quick configuration task enables machine builders and automation control programmers to easily integrate EtherNet/IP communication into their projects. The user enters EtherNet/IP parameters and assembly instances into an intuitive EtherNet/IP grid–no Ladder programming is required. Previous Previous post: If budget=text display, try Samba™ by Unitronics.